Swahili, a Bantu language with Arabic, Persian and other Middle Eastern and South Asian loan words, later developed as a lingua franca for trade between the different peoples. 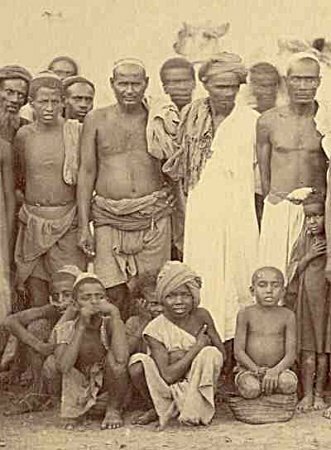 The Luo of Kenya descend from early agricultural and herding communities from western Kenya's early pre-colonial history. The Luo people and dialects of their language have historic roots across the Lake Victoria region. Chief among the powerful families to which the Luo trace their ancestry were the Sahkarias of Kano, the Jaramogis of Ugenya, and the Owuors of Kisumo, whose clans married several wives and had multitudes of grandchildren and heirs to various chieftainships. Leaders of these lineages typically had multiple wives and intermarried with their neighbours in Uganda and Sudan. The Luo tribe, through intermarriages and wars, are part of the genetic admixture that includes all modern East African ethnic groups as well as members of Buganda Kingdom, the Toro Kingdom, and the Nubians of modern day Sudan. In recent times, the Luo have had many enemies with whom they fought for access to water, cattle, and land including the Nandi, Kipsigis and the Kisii. As a result of these wars were peace treaties and intermarriages were resolved resulting in a mixture of cultural ideals and practices. As with all so-called tribes of modern day East Africa, Luo history is intricately interwoven with the histories of their friends, enemies and neighbours and attest to the complexity of East African precolonial history.